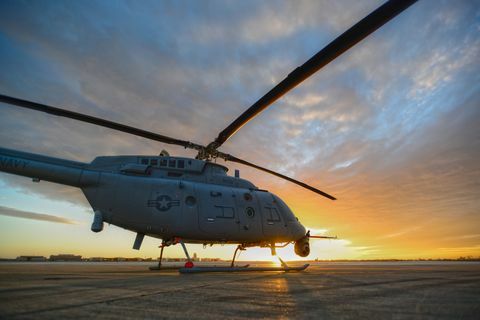 SAN DIEGO â April 7, 2014 â Northrop Grumman Corporation (NYSE:NOC) will build five additional U.S. Navy MQ-8C Fire Scout unmanned helicopters, which allow ship commanders to extend their intelligence-gathering capabilities far beyond the horizon. Final assembly of the aircraft will take place at the company's Unmanned Systems Center in Moss Point, Miss. The MQ-8C is based on a larger helicopter airframe that provides greater range, endurance and payload capacity over the currently fielded MQ-8B Fire Scout variant. "Land-based flight tests of the system are progressing well and we're working with the Navy to conduct our first ship-based flights this summer," said George Vardoulakis, vice president, medium range tactical systems, Northrop Grumman. "We expect the MQ-8C Fire Scout will be ready for operations by year end." The MQ-8C can remain on station for more than eight hours and supporting long-duration missions, thus requiring less aircraft to sustain operations. A total of 19 aircraft are under contract with the Navy. Fire Scout uses on-board sensors to capture full-motion video, identify targets and distribute information in real time to various users. This allows ship-based commanders to maintain awareness of a specified area or keep an eye on a target of interest for long periods of time.